In the early 1970s, the Tejon Indian Tribe in southern California essentially vanished from U.S. memory when it was mistakenly omitted from the Department of the Interior’s list of federally recognized tribes. It took until 2012 for the tribe to be “reaffirmed,” decades in which the Tejon people lost all government aid and benefits, despite an 1851 treaty that assured them federal support. CDSC staff assisted members of the tribal stewardship cohort with their digital curation projects. Gloria Morgan, chair of the Tejon Cultural Resource Committee, talked about the effort to reinstate the tribe to the federal registry during a workshop she attended this fall at WSU’s new Center for Digital Scholarship and Curation (CDSC). 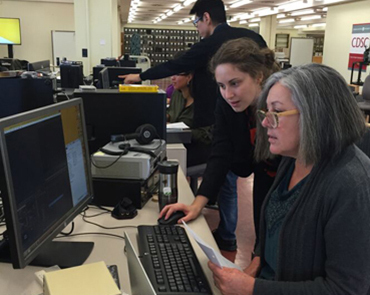 Morgan and members of several other Native American tribes came to the Pullman campus for hands-on training in digitizing cultural resources for their communities. Eye-witness accounts of national historic events. Detailed images of cultural treasures. Personal reflections on life, love, influential people, and transformative experiences. All this and more is being preserved, ethically and responsibly, through the CDSC. A collaboration between the College of Arts and Sciences and WSU Libraries, the CDSC provides members of WSU and the extended community access to digitization hardware and software for a variety of scholarship and curation projects, many that cross academic and public/private distinctions. “The CDSC serves as both a teaching–learning laboratory and a hub of support, outreach, and inspiration for meaningful, long-term partnerships between students, faculty, researchers, and community stakeholders,” said Kimberly Christen Withey, center co-director and associate professor of English. Housed on the fourth floor of Holland Library, the CDSC provides best practices for the organization, digitization, and preservation of unique collections. It offers assistance for scholars to explore new and emerging models of digital research, publishing, and peer review. The center also supports curriculum development, particularly the introduction of technology into courses, and offers faculty and students hands-on experience with digitization tools, such as video equipment and photo-editing software. With its focus on meeting the unique digital challenges and needs of underserved populations, the CDSC partners closely with Native American and indigenous communities nationwide to support the ethical curation of cultural resources. Home of the Mukurtu CMS—a shared online platform for the curation, management, and preservation of indigenous cultural heritage—the CDSC recently received a $69,500 Andrew W. Mellon Foundation grant, the first award from the foundation to WSU. History students used digitized photographs of the Civil War and its aftermath in exhibits they designed and displayed in the CDSC while learning about the era. Since it opened last summer, the CDSC has hosted a wide range of research and special-interest groups from throughout the University and the United States. The flexible workspace and online tools enable and encourage teamwork onsite and across distances and disciplines. Robert McCoy’s History 416/516 class has used the CDSC multiple times this semester as both a gathering place to exchange ideas and a technology-equipped workspace for creating digital exhibits about such study topics as the U.S. Civil War and Reconstruction era. Representatives of Native American tribes and cultural centers from across the country have come to the CDSC for hands-on training in digital curation, many as part of a three-year cultural heritage stewardship program coordinated by Withey and a multi-institutional team. Workshop participants quickly and easily converted the CDSC’s open space into a lively site of sharing, discussion, and experiential learning focused on the specific needs of tribal archives, libraries, museums, and cultural centers. A three-day storytelling workshop covered identifying a personal story to share, developing the story elements to appeal to a wider audience, and then telling the story with still and moving images, voice recordings, and music. Participants also learned how to scan images, locate copyright-free images and music, edit video clips and photos, and add titles and credits to their digital projects. For Morgan, learning how to digitize the thousands of pages of documents that prove the Tejon Indians’ long relationship with the U.S. government will be invaluable, she said. Among the documents is a 1915 census done by Bureau of Indian Affairs agent John J. Terrell, who identified 81 tribal members living on the reservation and their ages. This fall, a distinguished group of WSU arts and sciences alumni took part in a special interactive storytelling event led by Rebecca Goodrich, assistant director of the Digital Technology and Culture program (DTC), and facilitated by DTC students and CDSC staff. Thirteen Golden (’55) and Diamond (’65) Graduates and several of their spouses experimented with digital tools and creative ways to preserve memories of their college days and of significant people and events in their lives since then. Golden grads and former student body officers David McGoldrick (vice president), Julia Twohy Clarke (secretary), and David Warren (president) recreated a photo taken after their 1964 election. Among the touching, entertaining, and inspiring stories is David Warren’s recollection of his journey from being an English major (’65) and student body president to marching for civil rights with Martin Luther King, Jr., to living in Mahatma Gandhi’s ashram to leading an American “model city” to presiding over a university, championing access to affordable education, and more (including getting a hug from a U.S. president’s daughter). Thanks to the CDSC, you can listen to Warren’s story online (well worth the 10 minutes) and read or listen to other enlightening and poignant stories from CAS Golden and Diamond Grads. To learn more about the CDSC’s various resources or to schedule their use, contact cdsc.info@wsu.edu. Scholarly communication: share scholarly work, get support for open-access publishing, and access resources to assist with data management and assessment of scholarly impact. Key to nuclear waste disposal found? Taking art & brains to D.C.
40 years later, how are women doing? Why do we wage war?